J. Edgar Hoover is an endlessly fascinating figure in American history. As the director of FBI for more than 40 years, Hoover used his enemies most damaging secrets to become the most powerful player in American politics. Through questionable and illegal methods, Hoover maintained a frightening level of authority until his death in 1972. J. Edgar, the Clint Eastwood directed biopic about Hoover, gets at none of this. 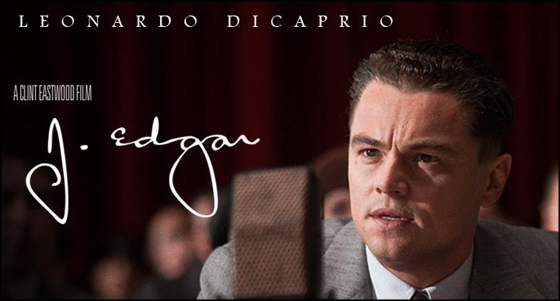 J. Edgar is able to limp along thanks to Leonardo DiCaprio’s performance as the title character. With the help of somewhat distracting aging make-up, DiCaprio morphs from a young workaholic dedicated to making the FBI great to a man nearing the end of his life. It is yet another round of “Get Leo an Oscar already” and DiCaprio turns out a fine performance. But DiCaprio’s performance, one of the film’s few saving graces, doesn’t change the fact that nothing that distinguishes J. Edgar from every biopic that has preceded it. We first see Hoover as an elderly and overweight man recounting his life for his memoirs. This allows the film to weave between pivotal moments in Hoover’s career and his personal life. Mostly through flashbacks we’re introduced to the other characters and relationships crucial to Hoover’s story. Judi Dench stars as his domineering mother. (Powerful men must always have a domineering mother.) Naomi Watts is sorely underused as his loyal secretary, Helen Gandy. And Armie Hammer portrays Clyde Tolson, the FBI’s Associate Director and Hoover’s alleged lover. Hoover and Tolson’s alleged relationship is probably the most fascinating aspect of Hoover’s life depicted in J. Edgar. Eastwood presents Hoover and Tolson’s as long quasi-unrequited lovers and confidantes with a deep admiration for one another. Tolson understands Hoover better than anyone else and knows exactly when Hoover has embellished the truth to make himself look like a greater hero in his memoirs. J. Edgar is disjointed and plot points are sloppily thrown together. It is almost as if no one planned out what pieces of Hoover’s life to really focus on. Is this a film about a man and his relationship with an overbearing mother? Is it about the alleged romance between Hoover and Tolson? Is it about an obsessive man’s determination to make the FBI more powerful than ever? When it comes to biopics, there is a often a need for the filmmakers to reveal what we already don’t know about notable historical figures. Sometimes it works. Sometimes it doesn’t. With J. Edgar, the decision to humanize Hoover waters the man down to almost nothing worth remembering. Haven’t seen the movie, but I have no doubt you’re spot on. In the trailer, the aged Leo looks like Phillip Seymour Hoffman to me – wouldn’t that have been an interesting double casting?? And yeah, we read you on the not-so-subtle George Bush reference, Eastwood. I feel like that’s the number one trick for giving movies political gravitas these days, but I think it’s really shallow. Plus I just hate Clint Eastwood. OK, my rant is now over. Good review. There are problems with the story mainly because it feels like we are just going through all of these events that happened in Hoover’s life, without any real connection or anything. However, DiCaprio’s performance is great and Eastwood really does know how to direct any type of film and at least bring out some rich drama with its story even if it may be a bit muddled. As a biopic J.Edgar was alright…The Last Mitterand was better, though.